Author Archives: Isn't That Illegal??!! The Hunger Strikers are in their 29th Day of valiantly protesting CPS’ denial of the Coalition to Revitalize Dyett’s plan for Dyett Global Leadership and Green Technology High School. I could write a fictional account of the story of brave and noble parents and community hunger strikers facing off against a power-hungry and greedy egomanic mayor. I could tell this story against the backdrop of a wealthy, predominantly white, trendy neighborhood versus an economically struggling, but up and coming and culturally vibrant black neighborhood. I would then probably be told by my editor that the story line was heavy-handed and unrealistic…but this is happening right now in Chicago! Last week, there was a ribbon cutting for a $21 Million dollar addition to Lincoln Elementary School in Lincoln Park, at which Dyett Hunger Strikers called out Mayor Emanuel on the racial and economic inequity of his education policies. In predominantly white and affluent Lincoln Park, Lincoln Elementary received a $21 Million dollar addition even though many Lincoln Parkers said they didn’t want the addition because: (1) it took away what little green space was near the existing school; (2) it would lead to more traffic headaches in already-congested Lincoln Park; (3) there was and are plenty of empty seats at nearby Manierre Elementary just south of North Avenue that could serve students on the south side of the current Lincoln Park Elementary boundaries and that Manierre is actually closer to those families living on the south side of the Lincoln Elementary boundaries; and (4) it was unjust to treat the people in this affluent, predominantly white neighborhood differently than the people in poor black and brown neighborhoods, many of whose children have seen their neighborhood schools shuttered and have been forced to travel much further distances for what is not always a better-performing school. The two maps below show the boundaries of Lincoln Elementary and Manierre Elementary. Mayor Emanuel is so desperate to hold sway with his wealthier, predominantly white constituents, that he panders to them by giving them an addition that many, many said they did not want. It is significant that the racial makeup of Manierre is 94% Black and 0.3% white, while Lincoln Elementary is 11% Black and 64% White. 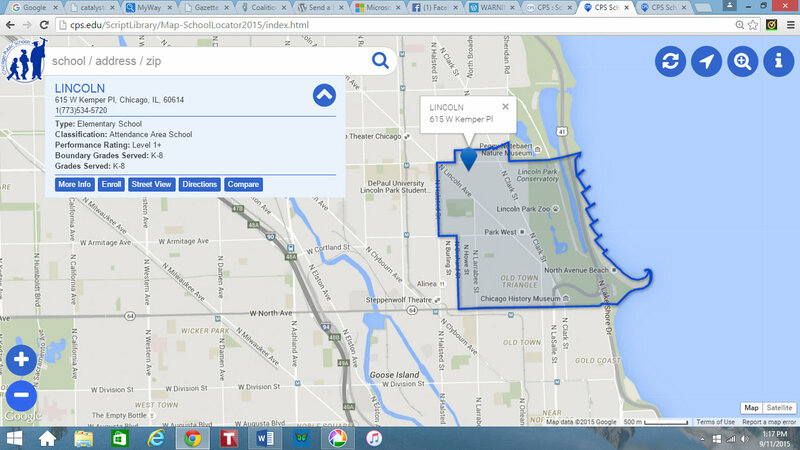 Map of Lincoln Elementary Attendance Boundaries from CPS website. 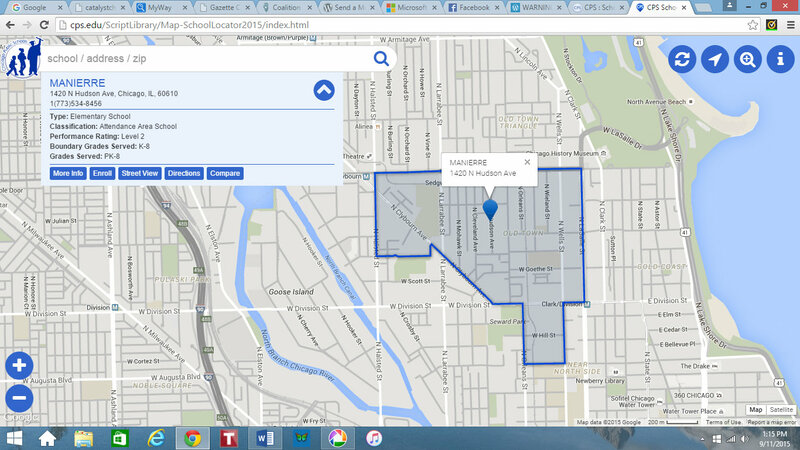 Map of Manierre Elementary Attendance Boundaries from CPS website. There is an egregious, racist and classist double standard in Rahm Emanuel’s Chicago. Some people of privilege willingly ignore the injustice, some think the Dyett struggle doesn’t apply to them and some are just unaware of the herculean effort put forth by so many individuals to bring the vision of promise of a bright future, economic power and justice to the children in the Bronzeville Community. The Dyett Hunger Strikers have jumped through every hoop Rahm Emanuel and his staff have put in their way and are desperately, righteously fighting for the right of people of color to have a meaningful voice in the education of their children. The Proposal for the Dyett Global Leadership and Green Technology High School is phenomenal, unique, relevant, sustainable and worthy and there is no GOOD reason why CPS should deny this Community this school of their own design. Here is the link to the proposal. The denial of this wonderful, educationally-sound, forward-thinking proposal for the Dyett Global Leadership and Green Technology would never happen in a predominantly white, more affluent neighborhood. Below is the list of the organizations who came together to form a Coalition to Revitalize Dyett along with their websites. Had this proposal to reopen a shuttered, but needed, neighborhood high school been put forward in Lincoln Park, Sauganash or Edison Park, CPS would be jumping through hoops to bring about the phenomenal plan that these organizations have been working on for years. On this, the 29th Day of the Hunger Strike of the Dyett 12 (now Dyett 15), the struggle for justice is very clear. This action is not about one school on the north side of Hyde Park in Chicago. It is the demand for respect, dignity and self-determination for a strong coalition of voices in a relatively poor, primarily black neighborhood in Chicago. It is about the fight for equal educational opportunity for the poor and people of color nationwide. It is also about the future of public education in our country, because, unless we citizens stand up against the kind of greedy, profit-driven policies that are at the heart of Rahm Emanuel’s Chicago, the Privatizers are coming for your children’s neighborhood school in the not too distant future. True justice will only be achieved for this group in Chicago after Rahm Emanuel and CPS heeds the righteous call of the Coalition for the Revitalization of Dyett and commit to open Bronzeville’s Dyett Global Leadership and Green Technology High School. Mayor Emanuel’s failure to do so is racist, classist and a slap in the face to the dedicated brave men and women who have literally worked for YEARS and who are literally putting their health and lives on the line to bring attention to THEIR fight for THEIR Community and THEIR Vision for THEIR Open Enrollment Neighborhood High School. We all want opportunity for our kids. People of Good Will, please support the Brave Dyett Hunger Strikers as they fight for the future of their Children’s Education and their Community! Please call Mayor Emanuel’s Office daily at 312.744.3300 until he commits to open the Coalition to Revitalize Dyett’s Proposal for the Dyett Global Leadership and Green Technology High School. 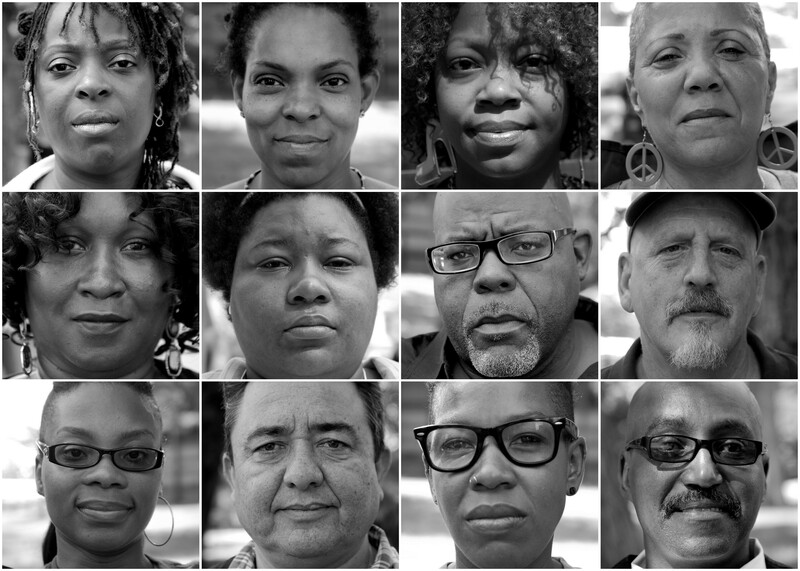 I write this in support of the dedicated, honorable and brave 15 Dyett Hunger Strikers. You have my everlasting respect and admiration.